In a crunch to fit in some science? 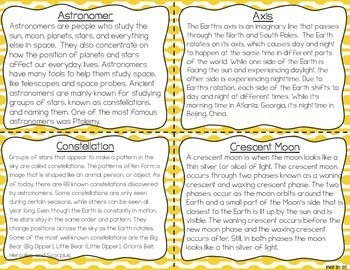 Try these Cycles & Patterns in Space task cards during your literacy block! 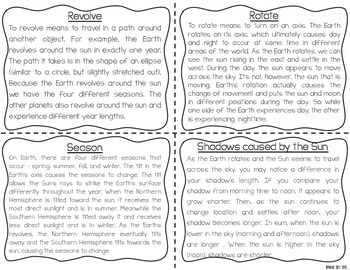 This activity would be great to introduce a unit on day/night, seasons, and moon phases, but is generic enough to use whenever! Help make it easier and "double dip" across content areas with these reading fluency and comprehension task cards. Need another activity to prepare for GA Milestones or your state's test that isn't a worksheet? There are twenty four reading passage task cards specifically addressing the key concepts of simple machines and motion. 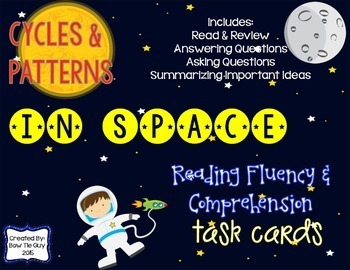 These cards are utilized in three different ways to promote fluency within nonfiction texts and to enhance comprehension skills. 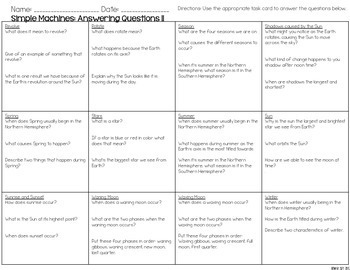 Students have a recording sheet to use to answer questions (3 questions per card for a total of 72), generate their own questions, summarize important ideas, and review. You could use the task cards for three days and have each student to do all three recording sheets OR this could be differentiated based on specific reading skills that students need to practice. Students could even work in partners or complete it individually as an assessment. The possibilities are endless as we "double dip" across content areas and strengthen upper grades reading skills! Geared toward Georgia Fourth Grade Science standards but not specific. Looking for regular Day and Night Task Cards? Click here! Don't Miss My Newest Integrated & Differentiated Resources!